RPG Ramble: January 22nd Edition - Completed Tables! RPG Ramble: January 17th Edition - Completed Tables! + I really enjoy playing her a lot! + Because who doesn't like the eevee evolutions? really..
+ I enjoy playing her, and I wanted to make her more independent without Ash. + My second crazy-girl muse! + She loves pies! Who doesn't love pies? + I cannot play Noel in game, wtf me? + wtf is this and why am i even tempted? + because I <3 laura bailey? + Because she is Beato? + idek, but she is cute? I do have several other journals on several other places, but no other rp accounts on journals. Forum Roleplay: Finishing off application for guild roleplay, doing a pathfinder new players game. Other Roleplay: Currently doing roleplay with my fiance in Guild Wars, Guild Wars 2, RIFT and Final Fantasy 14. Finally fixed the table (thus all the edits to this thing!) but it's still not complete. I need to add quite a bit to it before I have all my current RP journals on it and then I plan to work on updating the want-to-rp table (hehe, that's going to take a bit XD). I also plan on updating some of the icons for characters (mostly for dressing room / muse box purposes, I see my small list of icons for Dawn for example and cry inside). So, it's been a while since I updated this last.. so let's see. I reserved Yui several months in a row, before deciding to wait till I had her app done before reserving for her again. Then I applied for her, did a revision but sadly was unable to word my personality well enough to get in. I didn't apply or reserve anyone this month, though I have been making an list of all my apps (accepted, revised, declined and unfinished) so that I can pick from a pool for next month. Anyway, that's all till next month :D. I am really getting back into the swing of wanting to roleplay here or on LJ again, I just need to work on getting my apps perfect. But why Milla? Well, I just think her character grew on me while playing Tales of Xillia, not to mention her voice actress who does an amazing job at doing her voice. Honestly, this is a bit of a hard question for me. I've seen Stu play a lot of games and some I've even co-op'ed with him. So yeah, Tales of Destiny: Director's Cut for now... though you never know what it might be in the future, hehe. Other Roleplay: Currently doing roleplay with my boyfriend in Guild Wars, Guild Wars 2, RIFT and Final Fantasy 14. So, big things that have happened since my last RPG post is just my Luna facebook account becoming a Kiko account (though I still plan to play Luna a little), choosing between the two winx girls and picking Aisha and not starting the umineko rp atm. I did apply for Kud last month, and never got in because I didn't write enough :(. I never finished my planned second application on time but I do plan to apply again this month for someone (secret :P). So, as you can see from above, I have added a new section called 'Non-Journal Related' as an old LJ RP friend asked me if I wanted to do some facebook roleplay and I couldn't say no <3. I have a lot of good memories about roleplaying with her, so naturally, I wanted to rp with her again, even if it is on a different site than before. I didn't get as much done as I thought I would last month (I got kud's application finished but was too scared to post it to Somarium. I have recently posted it with an updated personality though.) but part of that was because my university sent me a letter out of nowhere that threw me for a loop as well as finding out my results for Japanese stage 4. Not too much has changed between April and now, but since I've not done an RPG update here since March, I figured it would be a good idea to at least note things that have happened. In april, I planned to apply as Kud from Little Busters! to Somarium. I reserved her and started her application, but never got it finished in time for the deadline. In may, I didn't think too much about roleplaying, outside of doing it briefly in Guild Wars 2 during the Beta Weekend Event (and stress test) and doing it within Final Fantasy 14. Might pick those guys up as Original Characters in the future alongside my RIFT and Guild Wars mains. Planned to apply for Somarium again, but I never got around to doing the form nor the reservation. Didn't do much roleplaying outside of what is mentioned for April. Guild Wars BWE 3 rolls around, and I make new characters. These guys were fun as hell to roleplay as in game, maybe pick them up as Original Characters? Decided to start a application for a forum roleplay with my Guild Wars guild. The big one. 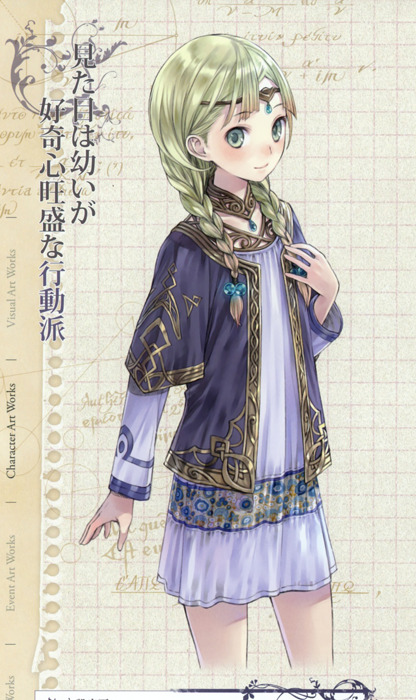 It's only the start of August, but not only do I want to do some of the stuff I mentioned above, but I also plan to pick up a few characters from Atelier Totori (see the list below). I obviously will try not to over work myself, but with the next Somarium application cycle starting on the 5th, it is really tempting to pick a Totori, ToGF or Little Busters character to rejoin with. Oh, and I plan to actually post with my RPG characters to Dear Mun sometime within the next few weeks, look forward to it! I'm finally back to posting after what's been a hectic couple of weeks and as you can see, 2 of my characters went home. It was hard to leave Somarium... really hard. But I knew it was the best thing for me to do as I was getting stressed. I won't go into too much more detail on that, but I do feel better now and am slowly working my way back to maybe playing again. I might give myself a few weeks more though, I don't want to rush it. As for siglen, I sort of didn't post there after leaving Som. I just didn't feel like roleplaying at all due to what was going on. I've moved the two characters there into the inactive game part as it is pretty much inactive/dead now. That said, I might still bring Marisa here to dreamwidth. But as I said above, I don't want to rush anything.. I want to take my time to slowly ease myself back in, perhaps pop a character into dear_mun on either here, livejournal or insanejournal before going into a full on game or dressing room. Nothing has changed character wise from last month outside of this, so I won't update the lists this time, just check my last post if you haven't already for who I play and want to play. I am finally back from hiatus today so I figured I would update what is going on RP wise with me and my characters. Usagi and Vanille are currently at siglen and I still plan to take Marisa there, once I advertise it a bit more to try and get some interest (I feel bad that I've been gone so long and I want to try to revive it. I've plurked the mod about it, and am waiting on her responding [I don't mind how long I have to wait, as I feel confident she'll get back to me eventually]). Speaking of, Marisa hasn't currently got a journal here. I was going to make it soon, but things sort of got away from me :(. Going to wait and see how things go before I make it now (and I will voicetest her on LJ to check I still have a grasp on her voice). Rika and Polka have moved here to dreamwidth as Somarium made the move here. I've not posted much with them here yet, but I plan to have it done sometime today :D. I've PMed all the people I had threads with on LJ prior to the move asking if they want to continue the threads or not, so I'll still be flicking between here and there. You might even see a few of my homeless characters on dear_mun sometime in the future XD. I've not archived any of their data to here yet or onto my PC. I still plan to do it for all my journals some point this year. Hopefully before April, but we'll see! Anyway, same as the last two times, here is my potential ideas that aren't listed on my planned characters followed by my current list and my planned list. Another Community Post?!? But you just did one here and on LJ!!! Yes, I know.. but I forgot to list the communities into sections for both posts and instead of going back and editing both posts, I figured I'd just post this one post. For those that have already read both posts, feel free to skip this one XD.. it's the same communities... just listed in order! I'll keep my eye on it, but for now glitterandgothic and seaglass_designs are gone. This will be short. As I said on plurk, it's not a good day for me right now, been feeling a little down :( and a bit sore/sick too.. but I wanted to get this post done now :D.
Usagi and Vanille have been added to dreamwidth and are apart of siglen_dressing! I might be taking Marisa back too (I say 'back' because I applied her at the original game that the dressing room is based off of). If Somarium moves to dreamwidth, Polka's journal will be copied over (maybe not all the entries, it depends on what the final decision is) and I will bring my Rika account over as she is reserved at Somarium (I will be posting her application for her soon). I plan to backup all my LiveJournal accounts at some point on the PC too (just in case, as I still regret not doing this for GreatestJournal and MoonJournal before they died [second one being attached to ASMR... how I miss it]). Anyway, here is the updated list of potential characters similar to last month's post and a up-to-date current character and planned character list.